In the gvSIG 2.0 development branch we are trying to make the compilation and building process as easy as we can. We try (with more or less success) to lower as much as possible the complexity needed to build gvSIG or any of its plugins, even more for new developers who want to start hacking, solving bugs or adding new funcionalities. One of those things we added to make developer’s life easier is the creation of gvSIG desktop launchers, so if you create a new plugin and workspace or you just try to build the gvSIG core projects, you will have it already available in your eclipse “Run configurations” menu. It worked very well until we had to change or upgrade any of the Andami dependencies. Then all previously prepared launchers where broken and had to be updated by hand. 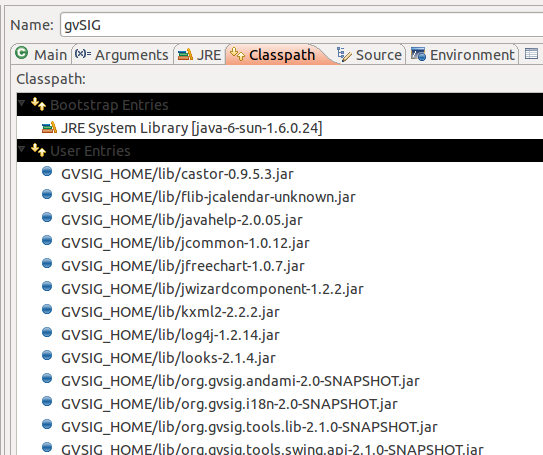 Luckily one of the changes performed in the gvSIG desktop 2.0 branch has been to change the build process from ant to maven, and the maven-jar-plugin has an option to fill the Class-path MANIFEST.MF entry automatically from the project dependencies. This entry was posted in development, english, gvSIG Desktop, gvSIG development and tagged classpath, development, gvsig, maven. Bookmark the permalink.